Version 1 of our Colorado River & Trail Expeditions Sierra Club Cup. Version 2 of our Colorado River & Trail Expeditions Sierra Club Cup. 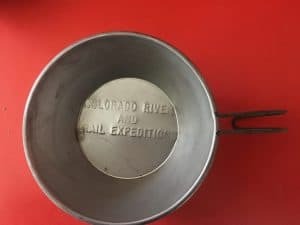 A few months ago while organizing and cleaning up some of our old gear we came across some “Colorado River & Trail Expeditions” stamped Sierra Club cups. Before we switched over to insulated plastic and stainless steel cups 30 years ago, sometime in the 1980s we outfitted our guests and guides with Sierra Club cups. They were in some ways the swiss army knife of early river running. They were used to lift coffee pots and dutch ovens off of driftwood fires; drink coffee, tea, water, lemonade, and hot chocolate; consume meals and desserts; measure out ingredients, cook with, and purify drinking water over the fire. They were usually worn on the belt and didn’t come off except for sleeping. They are a symbol of a different time in river running when the experience was absent of many of the creature comforts of todays elaborate expeditions. A time when it was standard practice to burn your lip on the steel rim of the Sierra Club Cup while drinking your morning coffee. 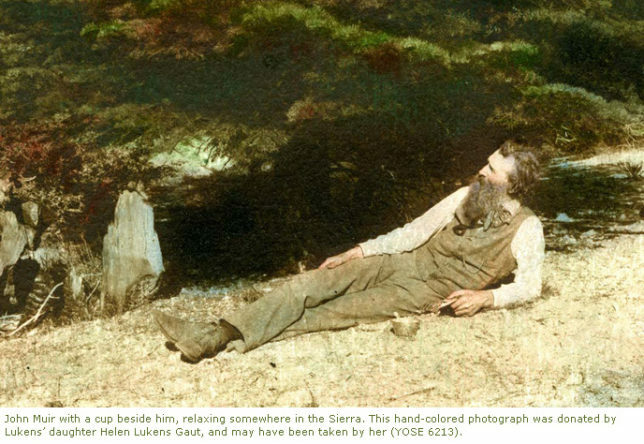 John Muir relaxing with his tin cup that would later evolve into the Sierra Club cup. John Muir whose environmental activism helped to preserve and protect the Yosemite Valley, Sequoia National Park, and many other wilderness areas co-founded the Sierra Club along with Professor Henry Senger, a philologist at the University of California-Berkeley in 1892. 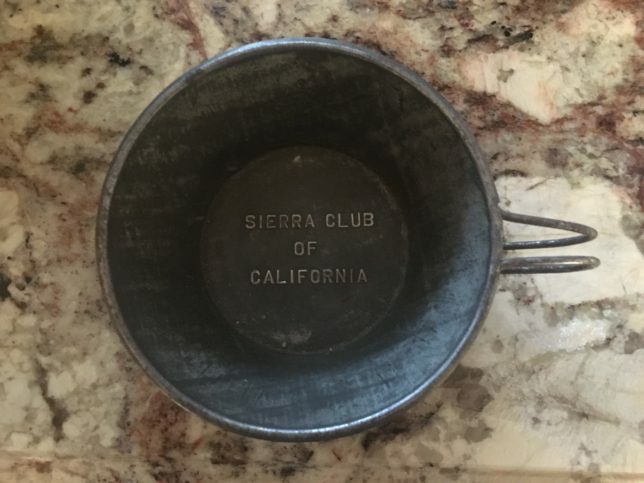 Muir was famous for trekking through the wilderness with “only a tin cup, a handful of tea, a loaf of bread, and a copy of Emerson.” This tin cup eventually evolved into the sierra club cup. Sometimes John Muir seems like a myth. Like a fantastical Greek god that strolled the forests belaying his unquestionable wisdom upon the creatures of uncharted lands and the withered pages of his notebooks. As he trekked through the backcountry of Yosemite, he triumphantly carried “only a tin cup, a handful of tea, a loaf of bread, and a copy of Emerson.” The fact that the Yosemite Museum has his tin cup in its collection has fueled accusations of hero-worship. With his quotations written in italics on the walls of most buildings in Yosemite Valley, he seems more like a prophet than a fallible traveler, a young man getting lost in the woods. But from most accounts, John Muir was shy. He was sensitive and had flaws, just like any of us. His tin cup reminds us of the human John Muir. Not only is it a tangible object that he carried and cleaned and tossed about in his pack, but it is a relic of a mistake. 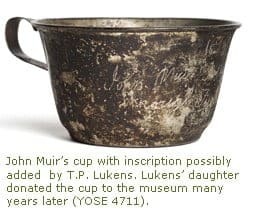 Muir left the cup behind, alongside a trail while he was camping through Hetch Hetchy in August, 1895. It was an accident. He forgot something, like everyone does. Maybe he had that feeling as he was walking onto the grass that day that he was forgetting something. Or maybe it had completely slipped his mind until he wanted a sip of hot tea the next night. Either way, we can empathize. We can feel, if only in this moment, like we understand and are equals with the fabled woodsman. In a world where Britney Spears’ chewed gum sells for $14,000 on eBay, we’re accustomed to sanctifying objects that have come in contact with our idols. And yes, John Muir did touch this cup. But that’s not the only reason it matters. More importantly, this rusted and mundane chunk of tin grounds the legend and myth back to the reality of an imperfect and utterly human man. A man we can relate to. John Muir’s Cup he accidentally left along the trail. and hang me on the belt of a good mountaineer.” Bright, little Sierra Club cups! Over the mountains they go, dipping pure, sparkling water for thirsty high-trippers. white streams cascading down from the blue sky, clear streams bubbling up from the ground. changing and changeless in sunshine and shadow, cups of cold water. 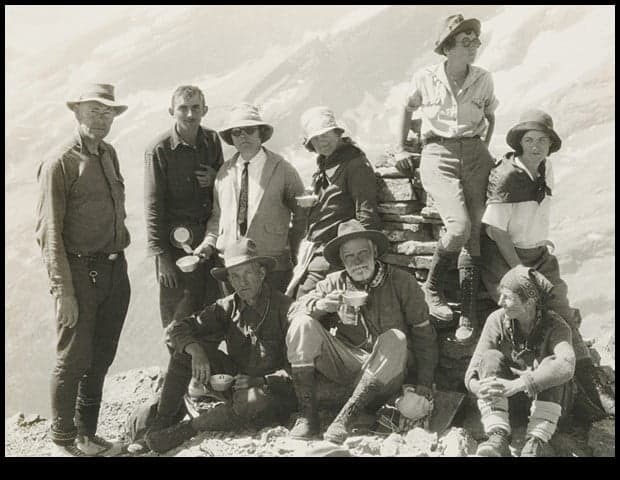 In 1928 the Sierra Club did a trip into the Canadian Rockies. 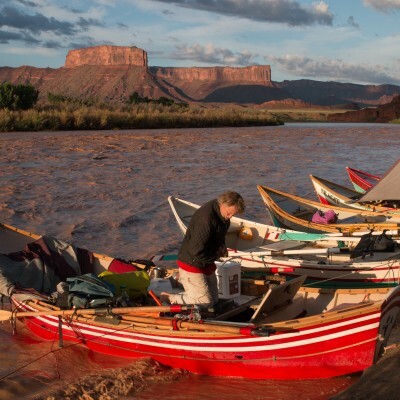 The same year that Glen and Bessie Hyde disappeared on their honeymoon river trip. One of the people on the expedition was Ansel Adams. This is a great photo showing Adams wearing his Sierra Club cup. In middle age, a father now myself, I flew by bush plane into the wilderness of Alaska’s Wrangell-St. Elias National Park, on an assignment for National Geographic. We were backpacking into a region seldom visited. Our guide, an Everest climber who knew the country, specified at the end of the equipment list he sent: Do not bring a Sierra Club cup. I bristled at this. At our first camp, when I debated him on it, he pointed out that the cup is not insulated. It burns your lips and tongue. And by the same principle that scalds the tongue—instantaneous heat transfer—the cup quickly turns hot food cold. It’s an awful little cup. I knew all this, in a subliminal way, though I would never have put it so brutally. But it misses the point. Communion goblets are not insulated either. Nor is the chalice in which wine is transmuted into the blood of Christ. For some of us, wild country really is like religion. For others—me, for example—it is religion, for we have been instructed in no other kind. The first Sierra Club cup dates back to 1905, when John Muir was fighting to keep the Hetch Hetchy Dam out of Yosemite. 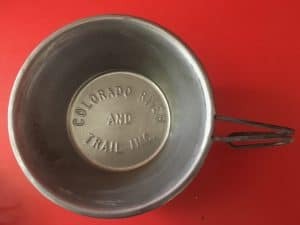 It was was the cup for mountaineers for the first three quarters of the twentieth century and continues to be a symbol of that incredible time of adventure. The original cups were stamped in tin, but changed to stainless steel after World War II. An original Sierra Club of California Cup dating somewhere between 1905 and WWII. The photo below was taken by Bob Whitney in 1974 of Bill Trevithick in Lava Falls. The photo was featured in the Whale Calendar. Bill Trevithick running Lava Falls Circa 1974 with Sierra Club Cups on Belts. 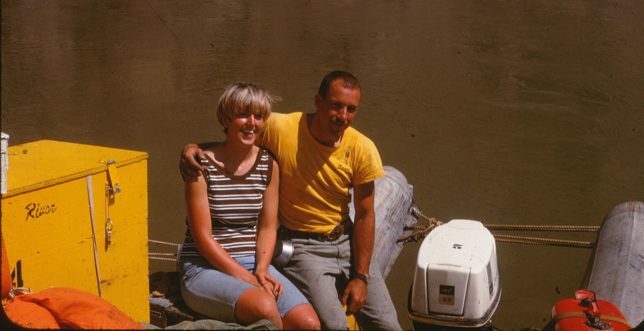 Photo of Colorado River & Trail Expeditions owners David and Vicki Mackay with Sierra Club Cup circa 1968. CRATE owners Dave and Vicki Mackay with Sierra Club Cup. Posted November 20, 2017 by Crate Inc.